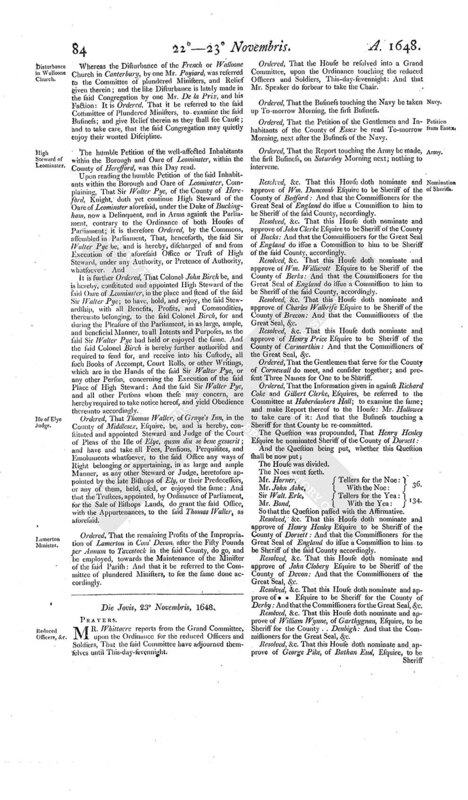 Journal of the House of Commons: Volume 6, 1648-1651. Originally published by His Majesty's Stationery Office, London, 1802. Die Jovis, 23 Novembris, 1648. MR. Whittacre reports from the Grand Committee, upon the Ordinance for the reduced Officers and Soldiers, That the said Committee have adjourned themselves until This-day-sevennight. Ordered, That the House be resolved into a Grand Committee, upon the Ordinance touching the reduced Officers and Soldiers, This-day-sevennight: And that Mr. Speaker do forbear to take the Chair. Ordered, That the Business touching the Navy be taken up To-morrow Morning, the first Business. Ordered, That the Petition of the Gentlemen and Inhabitants of the County of Essex be read To-morrow Morning, next after the Business of the Navy. Ordered, That the Report touching the Army be made, the first Business, on Saturday Morning next; nothing to intervene. Resolved, &c. That this House doth nominate and approve of Wm. Duncomb Esquire to be Sheriff of the County of Bedford: And that the Commissioners for the Great Seal of England do issue a Commission to him to be Sheriff of the said County, accordingly. Resolved, &c. That this House doth nominate and approve of John Clerke Esquire to be Sheriff of the County of Bucks: And that the Commissioners for the Great Seal of England do issue a Commission to him to be Sheriff of the said County, accordingly. Resolved, &c. That this House doth nominate and approve of Wm. Williscott Esquire to be Sheriff of the County of Berks: And that the Commissioners for the Great Seal of England do issue a Commission to him to be Sheriff of the said County, accordingly. Resolved, &c. That this House doth nominate and approve of Charles Walbrife Esquire to be Sheriff of the County of Brecon: And that the Commissioners of the Great Seal, &c.
Resolved, &c. That this House doth nominate and approve of Henry Price Esquire to be Sheriff of the County of Carmarthin: And that the Commissioners of the Great Seal, &c.
Ordered, That the Gentlemen that serve for the County of Cornewall do meet, and consider together; and present Three Names for One to be Sheriff. 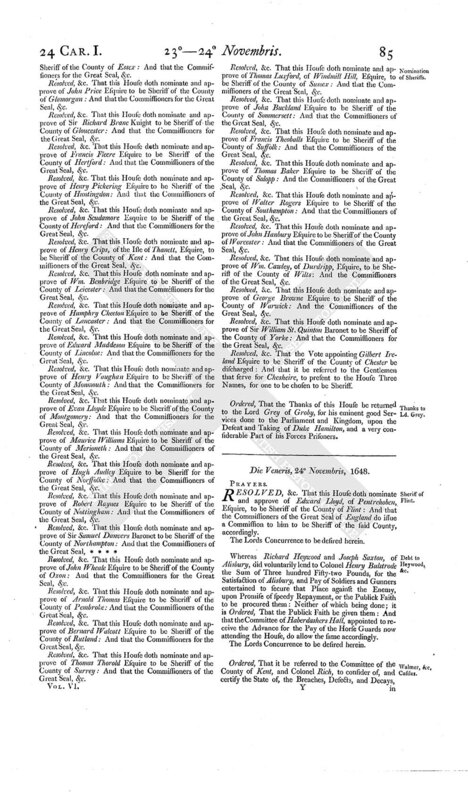 Ordered, That the Information given in against Richard Coke and Gilbert Clerke, Esquires, be referred to the Committee at Haberdashers Hall; to examine the same; and make Report thereof to the House: Mr. Hallowes to take care of it: And that the Business touching a Sheriff for that County be re-committed. Mr. Horner, Tellers for the Noe: 36. Sir Walt. Erle, Tellers for the Yea: 134. So that the Question passed with the Affirmative. Resolved, &c. That this House doth nominate and approve of Henry Henley Esquire to be Sheriff of the County of Dorsett: And that the Commissioners for the Great Seal of England do issue a Commission to him to be Sheriff of the said County accordingly. Resolved, &c. That this House doth nominate and approve of John Clobery Esquire to be Sheriff of the County of Devon: And that the Commissioners of the Great Seal, &c.
Resolved, &c. That this House doth nominate and approve of * * Esquire to be Sheriff for the County of Derby: And that the Commissioners for the Great Seal, &c.
Resolved, &c. That this House doth nominate and approve of William Wynne, of Garthygnan, Esquire, to be Sheriff for the County . . Denbigh: And that the Commissioners for the Great Seal, &c.
Resolved, &c. That this House doth nominate and approve of George Pike, of Bathan End, Esquire, to be Sheriff of the County of Essex: And that the Commissioners for the Great Seal, &c.
Resolved, &c. That this House doth nominate and approve of John Price Esquire to be Sheriff of the County of Glamorgan: And that the Commissioners for the Great Seal, &c.
Resolved, &c. That this House doth nominate and approve of Sir Richard Brane Knight to be Sheriff of the County of Gloucester: And that the Commissioners for the Great Seal, &c.
Resolved, &c. That this House doth nominate and approve of Francis Fleere Esquire to be Sheriff of the County of Hertford: And that the Commissioners of the Great Seal, &c.
Resolved, &c. That this House doth nominate and approve of Henry Pickering Esquire to be Sheriff of the County of Huntingdon: And that the Commissioners of the Great Seal, &c.
Resolved, &c. That this House doth nominate and approve of John Scudamore Esquire to be Sheriff of the County of Hereford: And that the Commissioners for the Great Seal, &c.
Resolved, &c. That this House doth nominate and approve of Henry Crips, of the Isle of Thanett, Esquire, to be Sheriff of the County of Kent: And that the Commissioners of the Great Seal, &c.
Resolved, &c. That this House doth nominate and approve of Wm. Benbridge Esquire to be Sheriff of the County of Leicester: And that the Commissioners for the Great Seal, &c.
Resolved, &c. That this House doth nominate and approve of Humphry Cheeton Esquire to be Sheriff of the County of Lancaster: And that the Commissioners for the Great Seal, &c.
Resolved, &c. That this House doth nominate and approve of Edward Maddeson Esquire to be Sheriff of the County of Lincolne: And that the Commissioners for the Great Seal, &c.
Resolved, &c. That this House doth nominate and approve of Henry Vaughan Esquire to be Sheriff of the County of Monmouth: And that the Commissioners for the Great Seal, &c.
Resolved, &c. That this House doth nominate and approve of Evan Lloyde Esquire to be Sheriff of the County of Montgomery: And that the Commissioners for the Great Seal, &c.
Resolved, &c. That this House doth nominate and approve of Maurice Williams Esquire to be Sheriff of the County of Merioneth: And that the Commissioners of the Great Seal, &c.
Resolved, &c. That this House doth nominate and approve of Hugh Audley Esquire to be Sheriff for the County of Norffolke: And that the Commissioners of the Great Seal, &c.
Resolved, &c. That this House doth nominate and approve of Robert Raynes Esquire to be Sheriff of the County of Nottingham: And that the Commissioners of the Great Seal, &c.
Resolved, &c. That this House doth nominate and approve of John Wheale Esquire to be Sheriff of the County of Oxon: And that the Commissioners for the Great Seal, &c.
Resolved, &c. That this House doth nominate and approve of Arnold Thomas Esquire to be Sheriff of the County of Pembroke: And that the Commissioners of the Great Seal, &c.
Resolved, &c. That this House doth nominate and approve of Bernard Walcott Esquire to be Sheriff of the County of Rutland: And that the Commissioners for the Great Seal, &c.
Resolved, &c. That this House doth nominate and approve of Thomas Thorold Esquire to be Sheriff of the County of Surrey: And that the Commissioners of the Great Seal, &c.
Resolved, &c. That this House doth nominate and approve of Thomas Luxford, of Windmill Hill, Esquire, to be Sheriff of the County of Sussex: And that the Commissioners of the Great Seal, &c.
Resolved, &c. That this House doth nominate and approve of John Buckland Esquire to be Sheriff of the County of Sommersett: And that the Commissioners of the Great Seal, &c.
Resolved, &c. That this House doth nominate and approve of Francis Theoballs Esquire to be Sheriff of the County of Suffolk: And that the Commissioners of the Great Seal, &c.
Resolved, &c. That this House doth nominate and approve of Thomas Baker Esquire to be Sheriff of the County of Salopp: And the Commissioners of the Great Seal, &c.
Resolved, &c. That this House doth nominate and approve of Walter Rogers Esquire to be Sheriff of the County of Southampton: And that the Commissioners of the Great Seal, &c.
Resolved, &c. That this House doth nominate and approve of John Hanbury Esquire to be Sheriff of the County of Worcester: And that the Commissioners of the Great Seal, &c.
Resolved, &c. That this House doth nominate and approve of Wm. Cawley, of Durdripp, Esquire, to be Sheriff of the County of Wilts: And the Commissioners of the Great Seal, &c.
Resolved, &c. That this House doth nominate and approve of George Browne Esquire to be Sheriff of the County of Warwick: And the Commissioners of the Great Seal, &c.
Resolved, &c. That this House doth nominate and approve of Sir William St. Quinton Baronet to be Sheriff of the County of Yorke: And that the Commissioners for the Great Seal, &c.
Resolved, &c. That the Vote appointing Gilbert Ireland Esquire to be Sheriff of the County of Chester be discharged: And that it be referred to the Gentlemen that serve for Chesheire, to present to the House Three Names, for one to be chosen to be Sheriff. Ordered, That the Thanks of this House be returned to the Lord Grey of Groby, for his eminent good Services done to the Parliament and Kingdom, upon the Defeat and Taking of Duke Hamilton, and a very considerable Part of his Forces Prisoners.